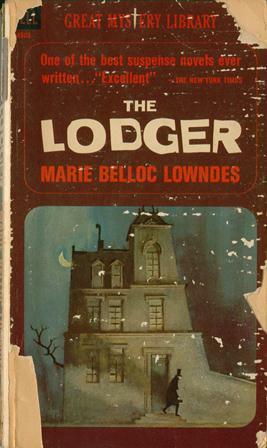 Miss Lemon can't think of a book more appropriate to recommend for such a chilly, foggy November day as this than The Lodger (1913), by Marie Belloc Lowndes. Indeed, thick fogs -- London particulars, as they were once known -- play a role as central to the plot as the protagonists do in this tale of psychological suspense based loosely on the very real unsolved murders of Jack the Ripper in 1888. Ellen and Robert Bunting, respectably retired from service, have fallen on difficult times and have little more to their names than a few pawn tickets and four respectably-appointed rooms to let in their house on the Marylebone Road. Though appearances might suggest otherwise, the couple are down to their last few pence, even after making due without such small comforts as tobacco and the daily newspaper. In fact, the couple are a hair's breadth away from starving. And then, just when Bunting can take it no longer, a savage murder is cried out in the streets. 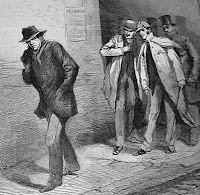 Overcome by the temptation to spend his last penny on the evening paper (all the ha'penny papers have gone), he leaves the gaslight on and a lodger, like a Dark Angel, appears at the Buntings' door. To Mrs. Bunting, his eight quid a month represent salvation. The lodger keeps extraordinarily odd habits. Not the least of which is walking out late at night when the London fog is at its filthiest and the streets are at their emptiest. He seems to have an obsession against drink and immoral women and a proclivity for reading nothing but the Bible. Above all, his late-night perambulations coincide unnervingly with the string of murders that terrorize London's East End. Published in 1913, The Lodger, for a reason inexplicable to Miss Lemon, is long out of print. The chilling story contained herein is a timeless one. While there is no onstage violence, the creeping unease steals in just like a fog. As you can see, Miss Lemon's copy of this excellent novel has seen better days. Thanks for the review. I remember those awful London fogs that we used to call pea-soupers.